If you know of a better link for a Perth below, or have a link for the Perths' missing a link. Welcome to North Perth where big-city attractions meet small-town charm. Surrounded by the beauty of Perth County's countryside, the towns of Listowel, Atwood, Monkton, and Gownstown make up this bustling area. A growing and thriving community, North Perth is home to 12,600 people within 25 minutes of Waterloo. 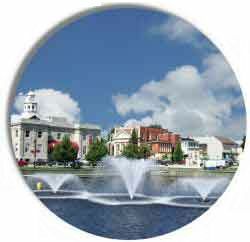 Italianate and Victorian architecture set the backdrop for Listowel's picturesque and historic downtown that boasts modern shopping and dining. Perth South is where the Avon and Thames rivers flow and farmland is bounteous and beautiful. This is the part of the county where the hamlets of Sebringville, Avonton, Kirkton, and St. Paul are tucked away and surrounded by some of the most fertile lands in all of Perth County. Wildwood Conservation Area is the region's leading outdoor recreational area for camping, sailing, fishing, mountain biking, and hiking. The past and present effortlessly collide in Perth East. This diverse area is rooted in Amish and Mennonite history and includes the communities of Shakespeare, Milverton and Millbank. West Perth is where nature, industry and culture exist in perfect harmony. Located within 35 minutes of London, this end of the county is a paradise for nature lovers and outdoor enthusiasts. Situated along the Thames River, Mitchell has restored over 65 acres of wetlands- the habitat of choice for rare bird species like the Blue Heron. Perth-Andover is located on the Saint John River, 40 km south of Grand Falls near the mouth of the Tobique River. Perth on the east side of the river and Andover on the west were amalgamated into one village in 1966 and have a population service area in excess of 6 000 people. Nestled between the rolling hills of the upper river valley, this picturesque village is often referred to as the "Gateway to the Tobique." Ten kilometers to the west of the Municipality is the U.S. border and to the south about 80 kilometers is the Town Woodstock and the entrance to Interstate 95 leading to the New England states. The city of Perth Scotland is the county town of Perthshire and also known as St John's Town or even as the Fair City. Perth's city centre is compact with two large and open public parks - the North and South Inches on each flank and the mighty River Tay along side. Much of the Perth's High Street is a traffic free precinct with a wide variety of shops large and small. Many of the streets around the centre are comprised of elegant Georgian terraced houses. Perth has probably always been a centre for farming and less dependent on the traditional Scottish industries of fishing, textiles and engineering. Not only did this give rise to its relatively small size but also to its air of prosperity. The city is a bustling market town with much to offer the tourist. Shops, galleries and theatre in the town centre. Scenery, castles, history, walks and attractions in the country around. Nearby is historic Scone Palace and Perth Racecourse. Perth is a modern and vibrant capital city, boasting a desirable lifestyle and great geographic location. As the capital city of the region, Perth is rapidly growing in both population and economic prosperity. Although a town of considerable historic interest, Perth,because of its location on the plains below the Great Western Tiers and because of the rather simplistic nature of some of its Georgian buildings, is not as interesting as its historic antecedents would suggest. Perth (the name comes from Perth in Scotland) was chosen as a future township by Governor Lachlan Macquarie when he passed through the area in 1821. It was proclaimed a township in 1836 and consequently has a considerable number of interesting and important historic buildings dating from both the Georgian and Victorian periods of colonial architecture. Perth is an unincorporated community in New Castle County, Delaware, United States. Perth is located northwest of Delaware Route 261 between Shipley Road and Silverside Road to the northeast of Wilmington. Perth is an unincorporated community in Sumner County, Kansas, in the United States. A post office was opened in Perth in 1882, and remained in operation until it was discontinued in 1954. Perth is an unincorporated community in Blue Earth County, in the U.S. state of Minnesota. Perth was originally called Iceland. A post office called Iceland was in operation from 1867 until 1871. The present name of Perth, after Perth, Scotland, was adopted in 1905. Perth Amboy, New Jersey, U.S.A.
Perth Amboy's long, rich history dates back to Dec. 8, 1651 when the Leni Lenape Indians (part of the Algonquins) granted a deed to Augustine Herman transferring the point at the mouth of the Raritan River to him. At that time, the land was known as Ompoge, which subsequently changed to Emboyle, and then to Amboyle. When the first three houses were built in 1683, settlers and officials began to call the land Ambo or Amboy, and finally Amboy. Amboy, the only city in the United States incorporated twice, received its first charter in 1718, by which time it was commonly known as Perth Amboy. It was incorporated a second time in 1784 after the American Revolution. The Town of Perth is in the eastern part of Fulton County, north of the Town and City of Amsterdam. The town was first settled around 1772 by pioneers from Scotland. Perth was formed from part of the Town of Amsterdam in 1838, when Fulton County was created. In 1842, the size of the town was increased by land from the Towns of Broadalbin and Mayfield. Perth is a city in Towner County, North Dakota, United States. The population was nine at the 2010 Census. Perth was founded in 1897. Perth had a newspaper, the Perth Journal, from 1898 to 1904.